On Valentine’s Day, Be Our Guest! Enjoy live music and eat-all-you-can dinner buffet. Treat your family and friends and enjoy sumptuous array of menu made especially for you, from appetizer, soup, salad to dessert and drinks for only P349.00.00 only. 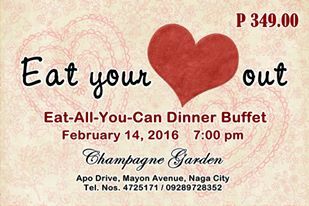 Tickets are available at Champagne Garden Apo Drive, Champagne Treats and Treats 2.0 along Mayon Avenue, Naga City.